Read my interview with Emily Calder here. If the world of childhood is a strange journey of misunderstandings, skewed observations, unexplained feelings, irrational beliefs and intense happiness buttressed against dark fears, then it is nothing compared to parenting. Childhood is perpetually defined by two perspectives, the parent and the child and we tend to see these two as opposites, when really they are two sides of the same coin, the children feeding as much of their own rapidly developing skewed perspective on the world into the minds of parents as the parents imagine they wield some sort of control over the duel laned highway of communicated messages. It is a surreal world, where children communicate fears as facts and tremble at the wild stories of others, as their parents do exactly the same thing over coffee as they watch. In Emily Calder’s world, the games children play in the sandpit are identical to the one’s their parents play in life. To highlight this point, and to dwell in nuances previously unexplored, Cough sees each parent performing the role of their child, the children depicted as puppets, in the cyclical relationship of reflected fears. Parents put their voices in the mouths of their children, literally, and yet the children interact with the independence born of too few consequences, and as the parents react to whatever their child is doing, we see the real puppet masters in charge of the game. Parents suspect, just as pet owners do, that their child is in control, but with Emily Calder’s clever words, this idea is brought to vibrant life in Cough. It is the children, led by their own dark imaginings, that decide what it is that adults will obsess over and the adults who watch the children closely in order to define their next move. At the heart of all imaginings, even fear, is the truth of the fabricated world, that it is vibrant, rich and filled with mystery. If Cough highlights the imagination of the child, it also highlights the imagination of the adult, they can see the surreal tree that springs up overnight just as the children can, even if they fear a different monster, each drawn to the dangers they purport to refuse feeling that same passion for he unexplored and the unexplained. If Cough says anything about the nature of the human creature, it is that the imagination never dies, it just gets more crazed. 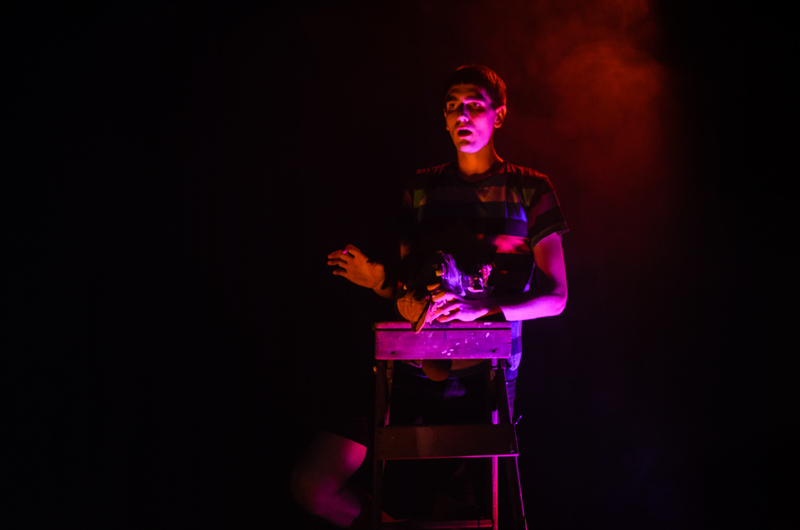 Cough is a piece of theatre perfectly at home with its collaborative relationships, and no where does this come out stronger than in the way James Dalton as director and Emily Calder work together to bring Cough to its dark mysterious life. There are no pastels, no toy emblazoned curtains or wall paper, no bright and airy rooms in this day care centre, Dalton and his team building a surreal world, exciting, cloudy and dark, an atmosphere that breeds the fear it nourishes. It’s the world of the children themselves, who believe a monster lives at the top of the strange tree that spring up overnight and threatens to eat them, but it is also the world of worried adults, terrified more and more of the various monsters they perceive threaten the children’s lives. 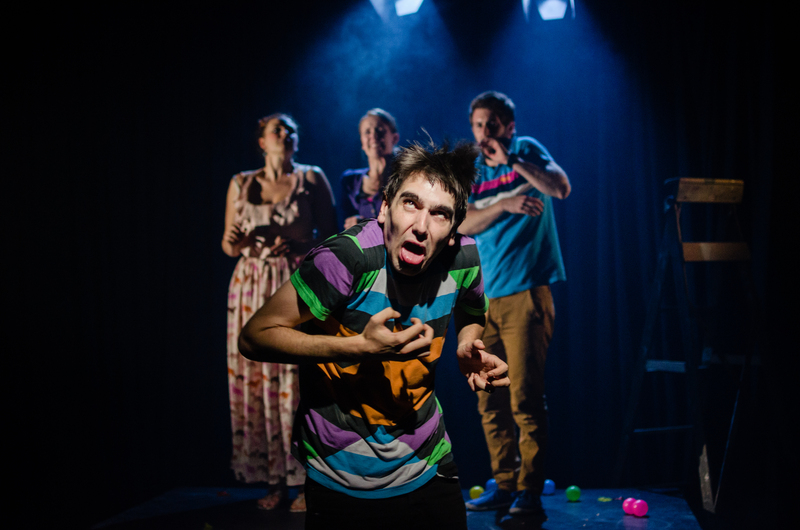 James Dalton keeps the atmosphere dark and the energy fearful, using child care centre objects such as brightly colored plastic balls and bubble machines to in dark and menacing ways, that tie us to the childish imaginings that are at the central theme of the play. Dalton turns Cough into a huge playtime event of its own, a reminder to adults to notice when their imagination has gotten the better of them. Essential to a play with borders this broad is an excellent cast and James Dalton has succeeded with a fantastic cast, led by the enigmatic Vanessa Cole as Isabelle, mouthpiece for parental fear, and her terrified child Isla. 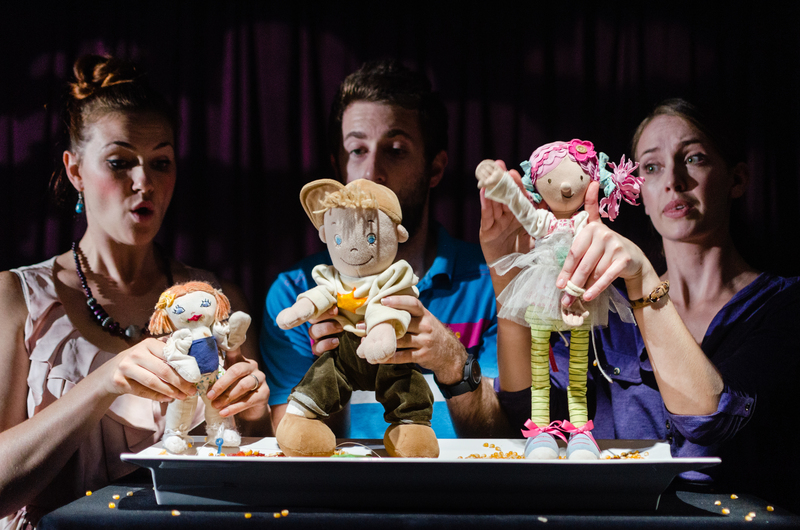 Melissa Brownlow is an attempted voice of reason as Julie, mother of the mischievous Jess and Tim Ruben is fantastically funny as Clive, the parent obsessed with the microscopic evils dwelling in the sandpit where his boy Finlay plays. Rounding out the fine cast is Tom Christophersen who brilliantly manifests the child (Frank) that always embodies everyone’s fears – he is the inventor of the monster at the top of the tree that fills the children with fear and he is the carrier of the barking cough that causes the parents to flare up against his previously popular mother. These tremendous performances are wrapped in Benjamin Brockman’s beautifully mysterious lighting and Tom Hogan’s intense sound design. Sound quite takes over Cough at several key points and becomes one of the plays primary methods for the delivery of overwhelming fear. 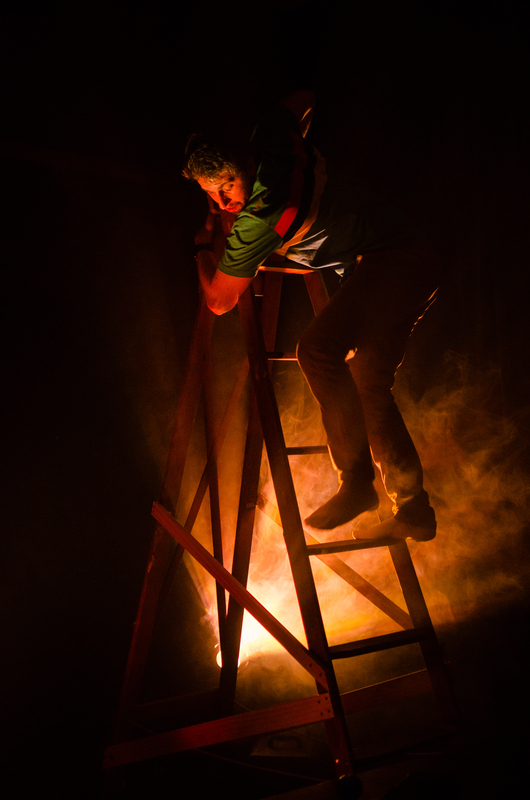 Cough is a thrilling theatre experience, by an exciting experimental Sydney theatre company and is not to be missed.